An entirely new way to experience dynamic and engrossing stories for free. [...] Unique layouts, animations, and visual effects, in regularly-updated episodes. Essentially, they're creating original animated comic books and graphic novels. Subject #9 combines sci-fi, adventure, and traditional superhero elements with colorful characters and an engrossing plot full of secrets and mysteries. We hope you'll enjoy reading Subject #9 as much as the team enjoyed creating it. Two episodes have already been announced, which are to be available in Russian and English. Max spent the last ten years in a coma. But one day, he discovered he could possess other people’s bodies. He was free to walk, eat ice cream, and watch movies. Life had meaning again! But with new power comes new responsibility... and new peril. The love of his life is in danger. To save her, Max and his friends must go toe-to-toe with the Mafia. 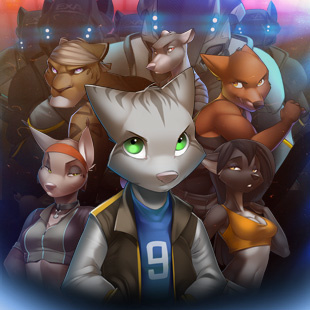 [Prodigal Angel is] a furry-style comic that doesn't focus on boring scientific research or medical terminology. Instead, this series is deeply character-driven, and focuses on a protagonist who, in his comatose state, discovers the ability to possess the bodies of other people! This is a series about melodrama with fantasy / supernatural overtones, a story of danger, adventure, unexpected twists and turns, and maybe even a comical situation or two. NARR8 also plans to cover manga, fantasy, sci-fi, horror and non-fiction topics in its line of "interactive stories, article and motion comics". The service is to "launch on the iPad in Fall 2012"; web and Android versions are expected next year. They had a booth at this month's NYCC. [...] the company’s monetization strategy, however, is built around a comics aficionado’s natural inclination to watch his favorite series almost non-stop. Each part will end at a critical and gripping moment. To find out immediately what happens next, users will need to pay – or otherwise wait to weeks to see the continuation of the content free of charge. Another way Narr8 makes money is through product placements to appear in short popular scientific stories. The firm – founded by Astrium Online dev lead Alexander Vashchenko and backed by a former Mail.ru VP – also proposes syndicating its content. I wonder when/if they will bring the app to Android. Currently it's only an apple exclusive. Wow, this is some pretty exciting news!